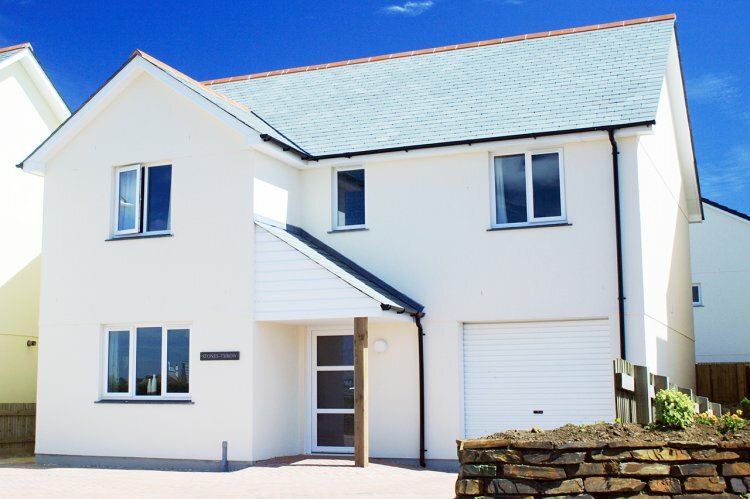 'Stones Throw’ is an executive style detached holiday home situated within walking distance to Mullion village and with access down to Polurrian beach via a bridleway. With Sky+, large wall mounted TV and wi-fi internet access it has every modern convenience as well as sea views! Updated for 2019! - new carpets, curtains, bedlinen, wall art, towels, and externally decorated. Short Breaks Also Available! - Select 3, 4 or 5 nights from 'Duration'. Entered via the large and airy hallway with downstairs cloakroom and stairs off to the first floor. Straight through to the large, fully equipped kitchen, with ceramic floor and oak finished units. Electric double oven, hob with extractor over, fridge/freezer, dishwasher and microwave. The separate utility room has a sink unit, washing machine and vented tumble dryer. The dining area is just off the kitchen and has a large pine table and chairs. Double doors lead out onto the patio which gets the sun. The lounge (sea glimpses) has comfortable seating for five people, coffee tables, wall-mounted flat screen TV, Sky+ (Basic package) and DVD, player. Upstairs are three bedrooms (one en suite), a second lounge and the family bathroom. Bedroom one (sea views) is a large bedroom, with 5’ king size bed, bedside tables and lamps, two double built-in wardrobes and a chest of drawers. En suite shower room is fully tiled and has double size cubicle, heated towel rail, matching handbasin and toilet. Bedroom two (sea views) has twin 3’ beds, bedside table and lamp and a built-in double wardrobe. Bedroom three has a single 3’ bed, bedside table and lamp and built-in double wardrobe. Family bathroom is fully tiled and has bath with mixer shower over, handbasin and toilet, shaver point and heated towel rail. In addition upstairs there is a second lounge with comfortable seating for four, LCD TV (freeview) and DVD. Outside driveway has parking for two cars. The rear garden is enclosed, with patio (garden furniture provided) and the rest laid to lawn. Rental includes bedlinen, towels, electricity, central heating, wi-fi access and Sky+ (basic package). This property will accept one dog by prior arrangement at £30 per week. NO SMOKING at this property please.